Closest feeling to having all of your teeth. Treatment performed in just one day. Includes FREE 3D CT scan. Implant manufacturer Nobel Biocare was among the first to identify the evolution of the All-on-4 technique as a potential valid and cost-effective alternative to conventional implant techniques, and funded studies by Portuguese dentist Paulo Maló to determine the efficacy of this approach. During this time this technique was also used by various other clinicians around the world. The concept itself of the total rehabilitation of a full set of teeth supported by as few as four fixtures was not a new one. Professor P-I Branemark, who discovered osseointegration, published numerous articles in the 1970s with successful rehabilitation of a full arch supported by this number of fixtures. However, it was the angulation of the back implants that led to today's All-on-4, and has been trialed by numerous clinicians simultaneously in the United States, Sweden, Portugal, and South America in the 1990s. The technique evolved when in an attempt to avoid certain anatomical limitations typically seen in the back of the upper and lower jaws have, clinicians successfully avoided bone-deficient areas with the use of angulated implants. 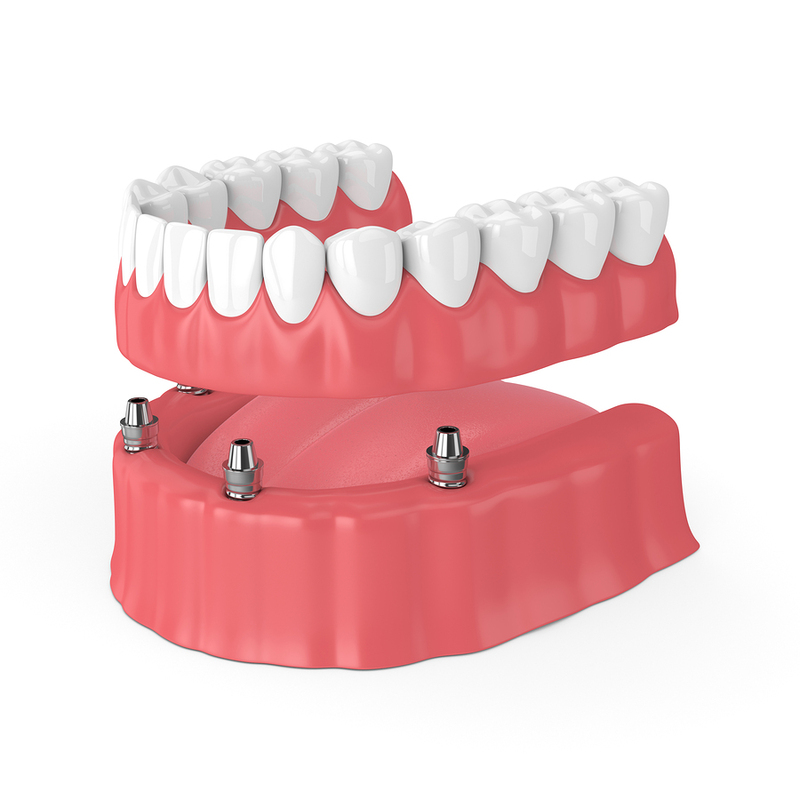 Anatomical limitations are more prevalent in patients with full dentures, and once the back implants are placed at an angle there is often only enough room left for two more implants in the front. This has led to the use of only four fixtures to support a full set of teeth. Patzelt SB, Bahat O, Reynolds MA, Strub JR (April 2013). "The All-on-Four Treatment Concept: A Systematic Review". Clin Implant Dent Relat Res. 16: 836–855. doi:10.1111/cid.12068. PMID 23560986. Zhao X, DI P, Lin Y, Li JH, Qiu LX, Luo J, Cui HY (October 2014). "Implanting the edentulous jaws with "All-on-4" immediate reconstruction: a preliminary clinical observation". Beijing Da Xue Xue Bao. 46: 720–6. PMID 25331394. Maló, Paulo; Rangert, Bo; Nobre, Miguel (2003). "'All-on-Four' Immediate-Function Concept with Brånemark System Implants for Completely Edentulous Mandibles: A Retrospective Clinical Study". Clinical Implant Dentistry and Related Research. 5: 2–9. doi:10.1111/j.1708-8208.2003.tb00010.x. PMID 12691645. Malo, Paulo; Rangert, Bo; Nobre, Miguel (2005). "All-on-4 Immediate-Function Concept with Brånemark System Implants for Completely Edentulous Maxillae: A 1-Year Retrospective Clinical Study". Clinical Implant Dentistry and Related Research. 7: S88–94. doi:10.1111/j.1708-8208.2005.tb00080.x. PMID 16137093. Branemark, Per-Ingvar (1977). Osseointegrated Implants in the Treatment of the Edentulous Jaw. Sweden: Almquivist & Weksell International. pp. 79, 81, 83. ISBN 91-22-00128-X. Kallus, T (Spring 1990). "Clinical evaluation of angulated abutments for the Brånemark system: a pilot study". Int J Oral Maxillofac Implants. 5: 39–45. PMID 2202668. Lefkove, MD (1990). "Immediate loading of cylinder implants with overdentures in the mandibular symphysis: the titanium plasma-sprayed screw technique". J Oral Implantol. 16: 265–71. PMID 2098572. "All on 4 Dental Implants in Tamworth & Lichfield | Tamworth Dental & Implant Clinic". www.tamworthdentists.co.uk. Retrieved 2017-08-07. https://allonfour.com/about-dental-implants/ "All-on-4 dental implants Poland, abroad- prices, reviews, before and after | Dental Travel Poland". www.dentaltravelpoland.co.uk. Retrieved 2017-11-02.